The Italian Film Festival in Miami Beach began its general run Friday night, following the special reserved opening on Thursday. Considering that this is the fourth annual festival, things were remarkably disorganized at the Regal South Beach 18 where the films are being screened. The one film of the evening began almost half an hour late, making me glad I paid for what I thought would be longer than needed parking. The films at the festival are preceded by an ad for Peroni Beer which is a pastiche that supposedly pays homage to La Dolce Vita but primarily serves as a reminder that you can plant a gorgeous blonde in a fountain, but Federico Fellini and Anita Eckberg are irreplaceable. As for the opening film, Romanzo Criminale, I might have liked it a bit more had I not seen The Departed earlier that day. Michele Placido can not be faulted for his ambitions. Romanzo Criminale is the fictionalized story of a group of street punks who become powerful gangsters in Rome from the 1970s through the end of the 1980s. The film attempts to duplicate the pull of mob life and the corrupting influence of power and money as in The Godfather films, while grafting the male bonding and pop music soundtracks of Scorsese's Mean Streets and Goodfellas. Romanzo Criminale is a sprawling film with a few too many characters to keep track of, many with colorful nicknames like Ice, The Lebanese, Dandy and Rat. The narrative also relies on some knowledge of Italian history and politics, with the gang involved in tracking The Red Brigade secretly for the government, and suspected of participating in the bombing of a train station. In a film crammed with effective performances, standouts include Kim Rossi Stuart as the gang leader known as Ice, Jasmine Trinca as his artist wife, Stefano Accorsi as the persevering police commissioner, and Anna Mouglalis as the prostitute caught between the police commissioner and the gangster called Dandy. The Italian Film Academy thought enough of Romanzo Criminale to nominate the film for several awards. Considering that Coppola was inspired by Visconti's The Leopard, while Scorsese has named Fellini's I Vitelloni as an influence, when it came to making the great Italian gangster film, Romanzo Criminale is easily dwarfed by the films inspired by the acknowledged Italian masters. Saturday began less on a less promising note with the kind of coming of age story that the Weinstein brothers could be counted on to import to American audiences. La Volpe is about as sentimental about life and films as Giuseppe Tornatore's Malena or Cinema Paradiso. Dionisio's film is about a poor, eleven year old boy who confuses an American general's wife, the red-headed Miranda Otto, with Susan Hayward. The boy, Vittorio, plays go-between for the wife and her lover, and learns life lessons about class, pride and honesty. A brief clip from David and Bathsheba plays on an outdoor screen. There is virtually nothing in the film that can't be anticipated, nothing that hasn't been seen before in better films. The title refers to a trapped fox that chews off his leg to escape, creating an awkward parable about the traps people find themselves in. During most of this film I was wondering why new films by Marco Bellochio, Nanni Moretti or Michele Soavi weren't part of the film festival line-up. As someone who paid for my festival pass, I would have loved the opportunity to see The Best of Youth which never received theatrical play in Miami Beach. The film known as Ginger and Cinnamon in the U.S. is available on DVD and has been shown on the Sundance Channel as recently as a month ago. The film is a faintly amusing trifle about a fourteen year old girl with the goal of losing her virginity during summer vacation to a handsome young man of about thirty who unknowingly is the ex-boyfriend of the girl's aunt. Lucheti attempts to make humorous observations about the difference between men and women, youth and supposed maturity, mostly taking place on the Greek isle of Ios, which as best as I can tell is like a low-rent version of South Beach with lamer music. There is one dumb but funny reference to The Simpsons. But when the thirty year olds speak longingly about such television fare as "The Facts of Life" and "Eight is Enough", the dangers of U.S. cultural imperialism become glaringly obvious. Carlo Verdone is a major star in Italy, who also follows the Chaplin template of writing and directing his films. My Best Enemy may not be the best film of the festival, but it is the best of this evening. Verdone plays opposite Silvio Muccino, who co-wrote this film. 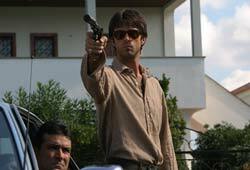 Muccino plays a young man who takes revenge for the firing of his mother by hotel manager Verdone, while unknowingly getting involved with Verdone's daughter. There is one funny scene with Verdone conducting a tryst in a supposedly secret lovers' lane, while Muccino discovers the site is popular among voyeurs armed with cameras and binoculars. My Best Enemy trades slapstick for poignancy as Muccino and Verdone go on a road trip, with Muccino looking for the father who abandoned him, and the two looking for Verdone's runaway daughter. This is one of those films that actually gets better as it progresses, though I had the feeling that if My Best Enemy does not get U.S. distribution, it might be counted on to reappear as a Hollywood remake with Steve Martin and Ashton Kutchar. I also want to add a link here regarding the "Giallo and Beyond" series I have helped plan. I don't know more than a couple words of Spanish, but it's always nice to see your name in print.